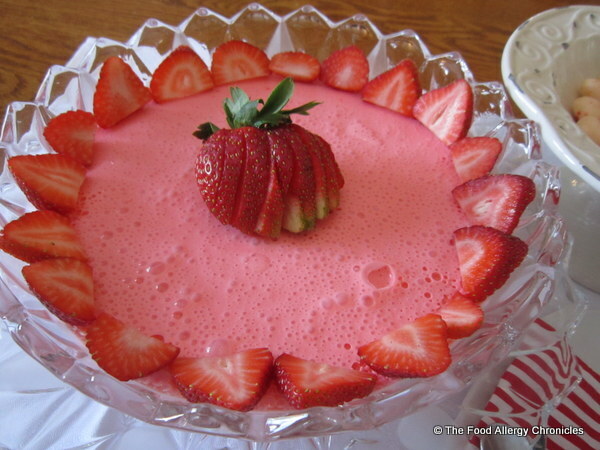 Posted on February 13, 2013 by Susan H.
Valentine’s Day is fast approaching…this quick and easy Dairy Free Strawberry Mousse is an adaption of another one of my childhood favourites. 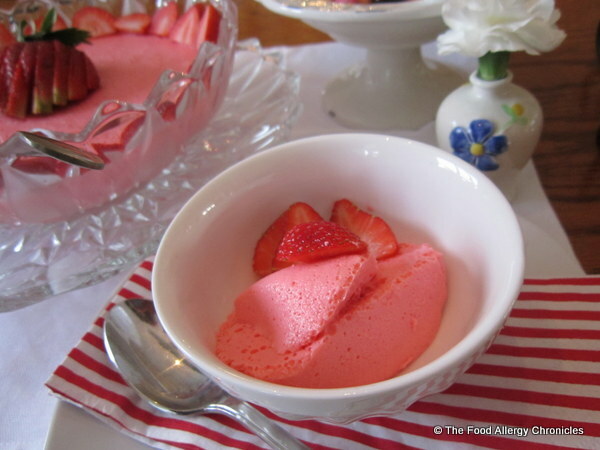 Topped with fresh stawberries…this light and creamy treat had Michael begging me to let him ‘dig in’! With just two ingredients (not including the water)…this beautiful dessert ‘whips up’ in no time. Just the time it needs to set. Topped with a chocolate covered strawberry…this would be the perfect dessert to celebrate Valentine’s Day with a loved one with a dairy allergy. In a medium bowl, empty contents of strawberry jello package. 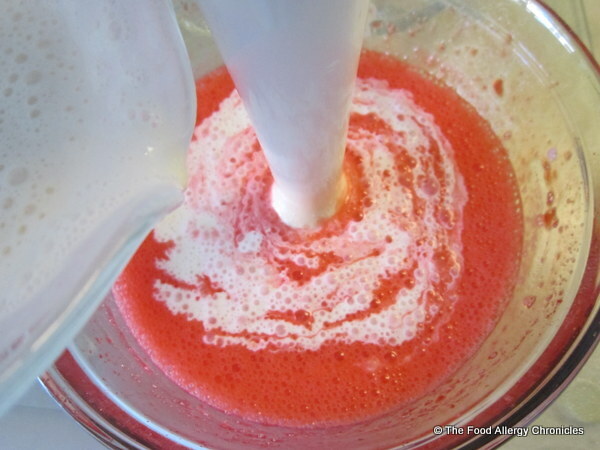 Pour 1 cup of boiling water over strawberry jello and stir until dissolved. Refrigerate until cooled and slightly thickened. In another medium sized bowl, pour 1 cup of the Belsoy Creamer. Whip Belsoy with an electric beater or a hand emulsifier until light and bubbly. Pour whipped Belsoy into the partly set jello. 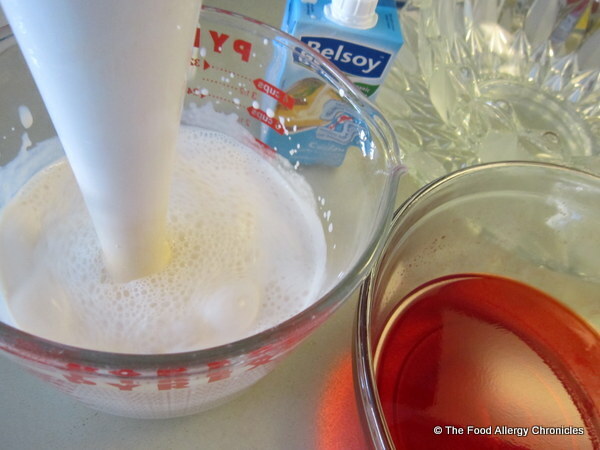 Continue to whip using the electric beater or hand emulsifier until the Belsoy and jello are combined. Pour into a decorative bowl or individual serving dishes. Decorate top with fresh strawberries. Michael loved it with the fresh strawberries mixed in to it…which has reminded me of another childhood favourite dessert to adapt…my best friend’s mother’s Strawberry Bavarian recipe. Tip 2: My mom always made this recipe with lime jello and decorated the edge of the bowl with chocolate sprinkles. 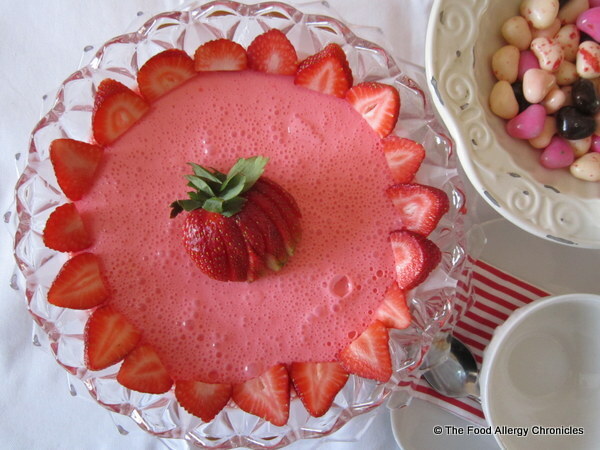 This entry was posted in allergies, dairy free, dessert, multiple food allergies, peanut/tree nut free, Valentines and tagged Dairy Free Strawberry Mousse, Natur-a Beloy Creamer by Susan H.. Bookmark the permalink. That looks delicious! Is it sugarfree?